Nikon V1 uses 1 inch 10 Megapixel CMOS sensor and Expeed 3 image processor, Canon EOS M uses 18 Megapixel APS-C CMOS sensor and latest DIGIC 5 image processor. Large sensors produce low noise and higher dynamic range. 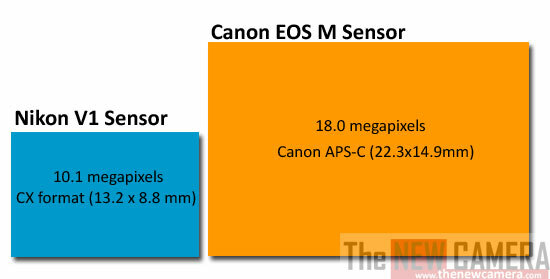 Canon EOS sensor offers standard ISO sensitivity up to 12800 for still image shooting and expandable up to 25600, on the other hand Nikon small 1 inch sensor offers standard ISO sensitivity up to 3200 and expandable up to 6400 only. Nikon V1 features the 135 AF point system with Phase and contrast detection AF, Canon EOS M comes with 35 point AF system with Phase and contrast detection AF system and with EOS M photographers can simply touch the display to pinpoint the area on which the camera should focus and instantly capture a still image. The V1 AF system is very fast and you do 10 fps shooting with full time AF tracking, the speed of EOS M is limited to 4.3 fps only. Nikon offer Full HD Video recording at 60 fps, Canon EOS M Full HD video recording is limited to 30 fps only, at HD mode you can select 60 fps speed, Both camera offers full time AF during movie mode. 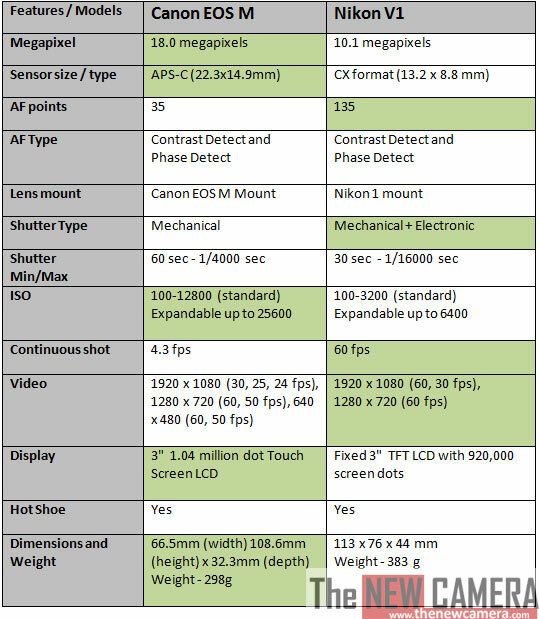 Nikon V1 with Fixed 3″ TFT LCD with 920,000 screen dots, whereas Canon EOS M comes with Touch Screen 3.0-inch Clear View LCD monitor II (approximately 1,040,000 dots) that features multi-touch operation allowing users to do “pinch-to-zoom” and “swiping” to scroll between pictures and Touch AF technology for video and still shooting. Canon EOS M is Compatible with all Canon Speedlite accessories including the new Speedlite 600EX and Speedlite Transmitter ST-E3-RT. Nikon V1 has only one option the Nikon 1 SB-N5 Speedlight made for Nikon 1 series camera. No viewfinder or any option available for Canon EOS M Mirrorless camera. Nikon V1 offers 1440k dot TFT EVF, good option for viewfinder lovers. Overall conclusion: If you are looking for a compact camera system with DSLR image quality, Buy Canon EOS M.
Nikon 1 system is recommended for sport & Action Photographers, it features advance AF system and continuous shooting up to 60fps, but remember the sensor size is small compared to Canon EOS M, so you get limited dynamic and ISO range.